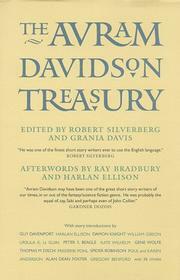 All agree that Davidson (1923—93) was a gifted and technically accomplished writer with a good ear for dialogue. He won awards in several categories and genres: a Hugo, an Ellery Queen, an Edgar, and a Howard (world fantasy), and he also edited The Magazine of Fantasy & Science Fiction, 1962—64. These 37 tales, arranged in four sections by decade (beginning in the 1950s, ending with the 1980s/—90s), with each introduced by a more or less famous writer or luminary (such as Gregory Benford, Damon Knight, John Clute, and Ursula K. LeGuin), offer an excellent overview of his output. Many, indeed, are famous, often reprinted, and have appeared in previous anthologies or single-author collections. If some of Davidson’s ideas seem familiar today, that’s because he invented or reinvented many of them, or adopted an independent and unexpected approach. Some of his most cherished tales, reprinted here: “The Golem,” offering Davidson’s own slant on the traditional Jewish legend; “Now Let Us Sleep,” a devastating commentary on racism; and his most famous yarn, “Or All the Seas with Oysters,”explaining why safety pins and coat hangers disappear. Other immediately recognizable titles include “The Goobers,” “Goslin Day,” “The Tail-tied Kings,” “Take Wooden Indians,” “Author, Author,” and “Dagon.” There are two afterwords that really aren’t: Ray Bradbury’s is a recycled introduction to a Davidson collection that appeared 25 years ago; and Harlan Ellison’s, penned in 1993 after receiving news of Davidson’s death, is more revealing of Ellison than of Davidson. Dense, erudite, and literary, these stories seem destined to find a small but highly appreciative audience.